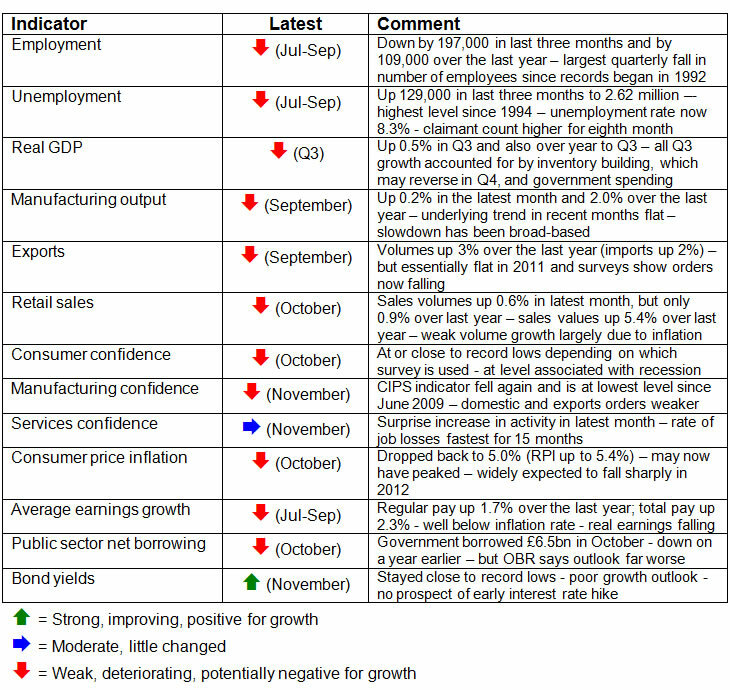 IPPR’s senior economist Tony Dolphin looks at the key economic indicators and reviews the state of the economy in his latest economic update for Left Foot Forward. 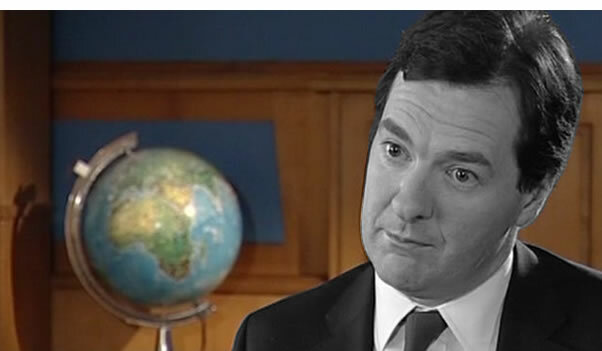 The UK economy is now teetering on the brink of recession. The Office for Budget Responsibility forecasts real GDP growth of just 0.9 per cent in 2011, followed by 0.7 per cent in 2012. 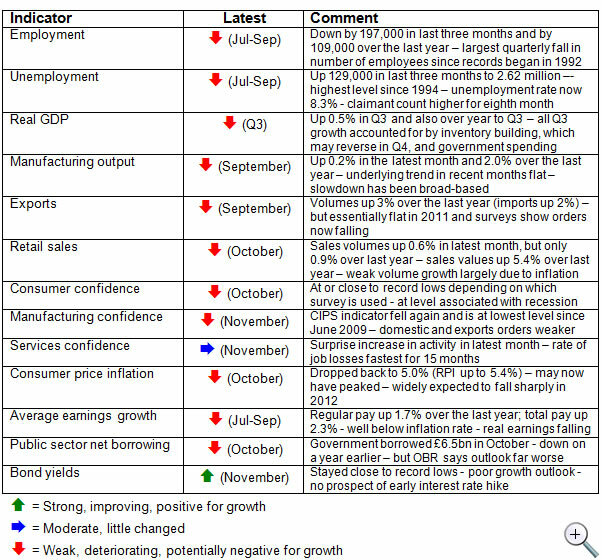 But in the two quarters between the third quarter of 2011 and the first of 2012 it expects no growth at all. The OECD is even gloomier, predicting just 0.5 per cent growth in 2012 and a very mild recession in the current and next quarters. The causes of this weakness in the UK economy are complex. Soaring food and energy prices have undoubtedly played a part, lifting price inflation well above the current level of wage settlements and so squeezing households’ spending power. January’s increase in VAT from 17.5 to 20 per cent had the same effect. More recently, the crisis in the eurozone will have affected confidence in the UK, though exports are performing better than domestic demand. The latest forecasts from the Office for Budget Responsibility (OBR) show a marked deterioration in the outlook for real GDP growth in 2011 and 2012, and in the medium-term outlook for the public finances. The government is now expected to have to borrow, in total, £111 billion more in the next five years than was previously thought. As a result, net debt in March 2015 is now forecast to be 78.0% of GDP, rather than the 70.5% expected in March. Instead of achieving his objective of a cyclically-adjusted current balance in 2014/15, the chancellor is now expected to reach this goal in 2016/17, and then only because he has announced further real cuts in public spending for 2015/16 and 2016/17. All the chancellor’s room for manoeuvre has now been used up. On the current rules, any further increase in the borrowing forecasts – whatever its cause – will necessitate more spending cuts or tax increases otherwise debt will not be falling in 2015/16. If the eurozone crisis escalates in the next few months, the chancellor will have to announce a further tightening of fiscal policy in March. The chancellor is sticking stubbornly to his ‘Plan A’ for deficit reduction because, he argues, to not do so would risk the confidence of bond markets, and it is a fact that bond yields in the UK are close to record lows. It is, however, debateable whether that is due to the chancellor’s fiscal policy or to the deteriorating outlook for growth, the recent increase in the scale of quantitative easing and the vanishing likelihood of an increase in interest rates in the foreseeable future. Certainly, the price to pay for low bond yields appears to be almost every other economic indicator turning red. 1. GDP increased by 0.5% in the third quarter: Preliminary figures show real GDP increased by 0.5% in the third quarter, and that it was also up 0.5% over the last year. The composition of this growth was, however, worrying. Consumer spending was unchanged from the previous quarter; business investment and exports were down. Growth was driven by a 0.9% increase in government spending and a 0.7% contribution from inventory building. If this inventory building was involuntary, as seems likely, it will reverse in the final quarter, subtracting from growth. 2. 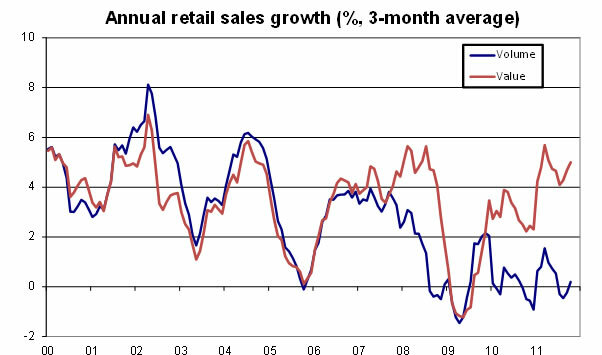 Retail sales volumes being held back by inflation: Over the last year, retail sales values have increased by 5.4%, but retail sales volumes are up just 0.6%. The difference is inflation on the High Street of 4.8%. Given that average earnings have increased by around 2% over the last year and employment has fallen, the increase in sales values could be described as surprising. It suggests households are switching spending from services to goods and that, despite low levels of confidence, they are not completely withdrawing into their shells. The latest month shows how lower inflation – just 0.1% in the month – can boost sales volumes, which were up 0.6%. 3. Consumer confidence is at levels associated with recession: Depending on which survey you choose to highlight, consumer confidence in October was either close to or at its lowest level since records began in the 1970s. On the previous occasions when confidence has been this low – in 1990 and in 2008 – the UK economy was going into recession. Households are particularly worried about the general economic situation, less so about their own finances. 4. Business surveys mixed in November: The purchasing managers’ survey of manufacturing dropped again in November and is well below the crucial 50 mark, indicating output in the sector is now contracting. Orders – both domestic and overseas – slipped and are at their lowest level since the middle of 2009. Surprisingly, service sector activity was stronger, with the purchasing managers’ index rising to 52.1, from 51.3 in October. However, job losses in the service sector were running at a faster rate than at any time since August 2010. 5. Manufacturing output is no longer increasing: Manufacturing output was up 0.2% in September, when it was 2.0% higher than a year earlier. However, output has not increased in the last six months, reflecting weaker demand at home and overseas. The slowdown is broad-based and not just due to the problems of one or two sub-sectors within manufacturing. Only in the transport and ‘other’ categories is output growing at a more rapid pace. 6. Employment is declining: Employment fell by 197,000 in the latest quarter (comparing July-September with April-June) and it is 109,000 lower than a year ago. The latest breakdown of employment in the public and private sectors is only for June, but it is likely that private sector employment is still expanding, though no longer at a fast enough pace to offset the speed of contraction in public sector employment. Surveys suggest private sector employment might also start to contract the in coming months as employers cut back recruitment plans. 7. Unemployment is increasing: On the Labour Force Survey (LFS) measure, unemployment is now 2.62 million – the highest level since the three months ending in September 1994 – and the unemployment rate is 8.3%, the highest since the three months to January 1996. In the last three months (to July-September) it has increased by 129,000. Youth unemployment exceeds 1 million for the first time since comparable records began in 1992. 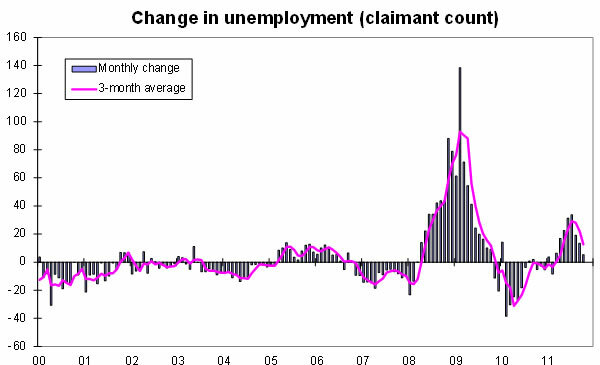 The claimant count measure has gone up for eight consecutive months, though in recent months the scale of the increase has been dropping – one modest bright spot in all the gloom. 8. Price inflation eased to 5.0%: Consumer price inflation fell back from 5.2% in September to 5.0% in October. Recent increases in domestic energy prices should now be fully reflected in the published data, so inflation has probably peaked. Forecasters expect it to drop sharply over the next year and, barring any further large increases in energy prices, it could be back in line with its 2% target rate by this time next year. No doubt this will be a great relief for the Monetary Policy Committee. It will also ease the pressure on household incomes. 9. 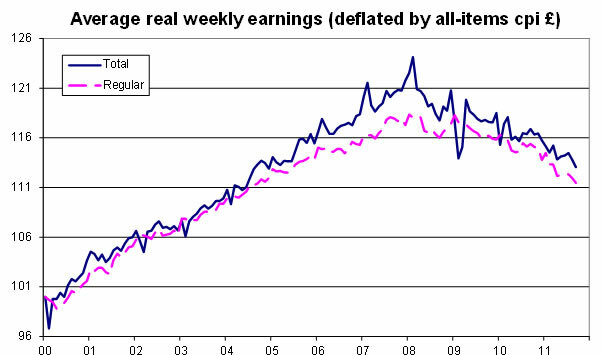 Wages fail to keep up with prices: Probably the main reason domestic demand in the UK has been so weak over the last year – and that growth has therefore disappointed – is the failure of earnings growth to keep up with inflation. Over the last year, to September, regular pay was up just 1.7%, while total pay, which also includes bonuses, increased by 2.3%. 10. Government borrowing is below last year’s path but above target: Public sector net borrowing (excluding financial interventions) was £68.3 billion in the first seven months of the financial year, down from £78.7 billion a year earlier. Borrowing for the whole year is, therefore, set to come in lower than in 2010/11. The OBR’s new forecast is for borrowing in the full year 2011/12 to be £127 billion, up from £122 billion forecast at the time of the March Budget. 11. Interest rates remain at 0.5%; QE at £275 billion: The Monetary Policy Committee left interest rates at 0.5% in November and the scale of quantitative easing at £275 billion. 12. Government bond yields close to record lows: The 10-year UK government bond yield remained close to its record low level throughout November and at one point was below the 10-year German yield. This reflects the deteriorating outlook for growth, the additional QE announced by the MPC and the ever-receding prospects of higher interest rates in the UK. 13. Sterling little changed in October: Sterling’s exchange rate against the euro barely moved during November despite all the turmoil in the eurozone. Both sterling and the euro did, however, fall a little against the US dollar. Exchange rates generally remain surprisingly stable despite big swings in equity prices and bond yields. Brown and Blair’s legacy. If you run up massive debts, almost all off the books, what do you expect? There is no room to manoeuvre. Massive cuts are needed just to keep from the nightmare of uncontrolled cuts. Look at Greece. The population has decided enough is enough and cut the government out of the look. Black economy has hit 50%. It’s going to go higher. So what does it mean for the clients of the state? They won’t get what’s promised, because what’s promised doesn’t exist. Even the civil servants are wising up here. They know that the extra contributions do not make their pension any safer, since the government is going to spend it now, leaving the debts still there. The client state who receives cash, such as those on benefits is going to find out it isn’t their either. They have been sold a pup. The state will look after you. Ah yes, but we haven’t got any money, your own your own. You’ve got to compete against all the economic refugees. Typical trolling. The UK started to recover. And then your Cameron choked it off. It was an impressive feat of cutting the UK’s economic throat. Austerity has caused this. Your answer? More austerity. Insanity. Corporate tax evasion is massive in this country. It’s perfectly legal. They just move overseas. Then what? You will winge about them being scum, when they are only doing what the Guardian does. If its an individual who complains about high taxation, you will complain, point out they are scum, and tell them to bugger off to another country.